Another week, another set of wonderful displays and exciting, close-fought contests in the Champions League. Let's take a look at some of the most significant chalkboards. While Málaga creating less chances in the first leg, they managed to create them in more dangerous areas. The pressure exerted by Málaga's forwards kept Gündogan from being as decisive as he had been in the first leg. 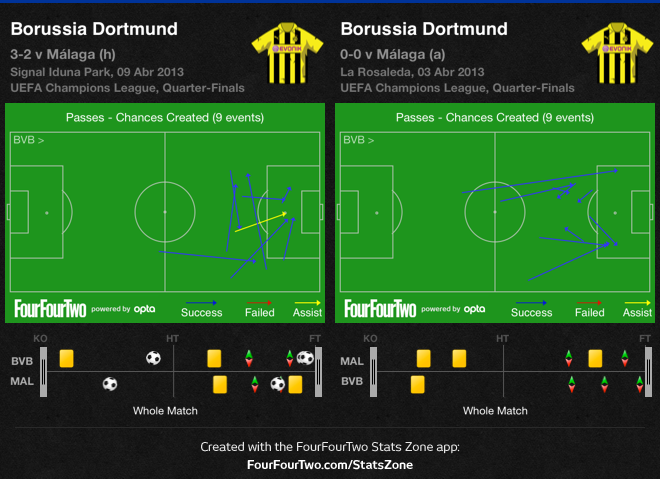 Borussia Dortmund's final push meant they managed to get the same number of chances as the first leg. undoubtedly due to their forwards' impressive work rate. Notice how the Spaniards made a lot less interceptions in the centre-back area. 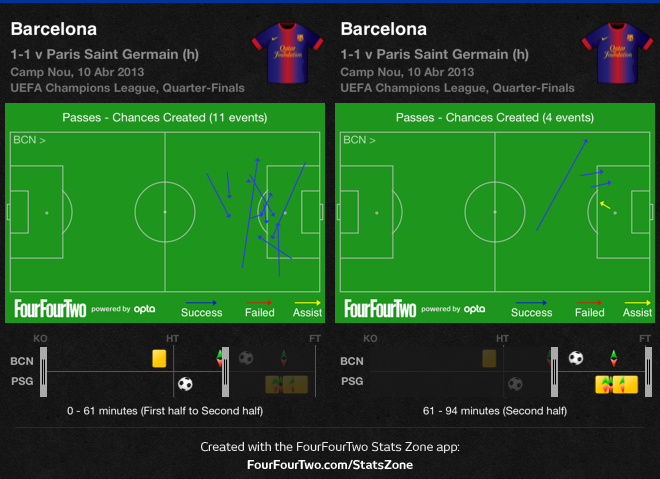 Barcelona's passing in their attacking third before and after Messi coming on. Barcelona's chances before and after Messi coming on. Not a huge difference in numbers. Barcelona's interceptions before and after Messi coming on. Oddly enough, this was the area where Barcelona improved most dramatically. Ibrahimovic put in a circumspect yet decisive all-round display against his former employers. 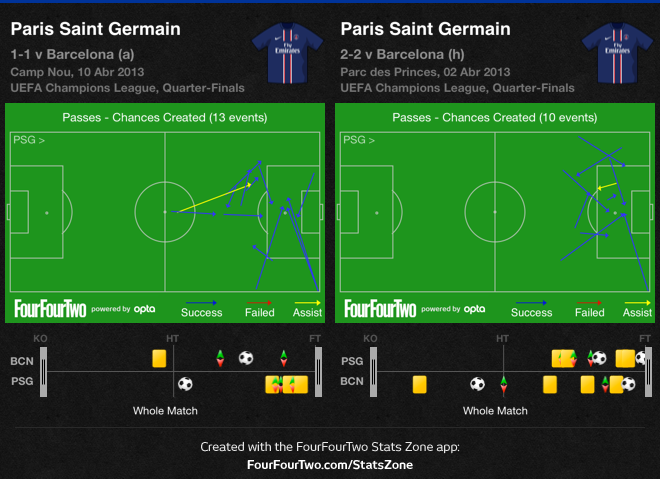 A comparison between the overall contribution provided by Verratti (first leg) and Beckham (second leg). The Italian midfielder was instrumental for Paris Saint-Germain's solid display. with several chances created down the middle. which translated in their almost identical number of shots home and away (albeit more dangerous in the first leg). 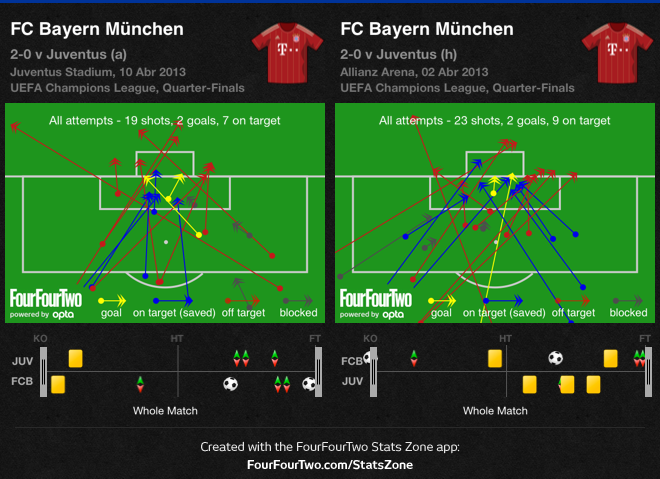 Bayern were even more proactive and successful as far as their defensive approach was concerned. Once again, notice far up many of their interceptions took place, preventing Juventus from threatening their back line. Facing an uphill battle, Galatasaray chose to take the game to Real Madrid, despite their early goal. In the second leg, Galatasaray defended higher up the field, as it's easily noticeable in the first chalkboard. Real Madrid's three-goal cushion, in turn, allowed them to work less hard defensively further upfield.